For the first time, the fifth annual Gift of Lights drive-thru holiday lights experience, benefiting local charities, will bring participants through the tunnel of lights and into the infield at New Hampshire Motor Speedway. The new route will extend the course to three miles and more than two million holiday lights when it officially opens on Friday, Nov. 20.
Who designs the Gift of Lights? 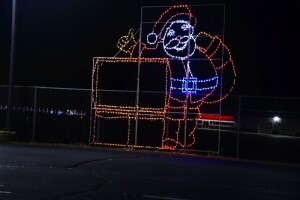 The lights are created by Indiana-based Winterland, Inc. and presented by New Hampshire Motor Speedway. How long does it take to set up? With over 400 displays, the setup takes more than 336 hours to set up. How many charities benefit from the Gift of Lights? 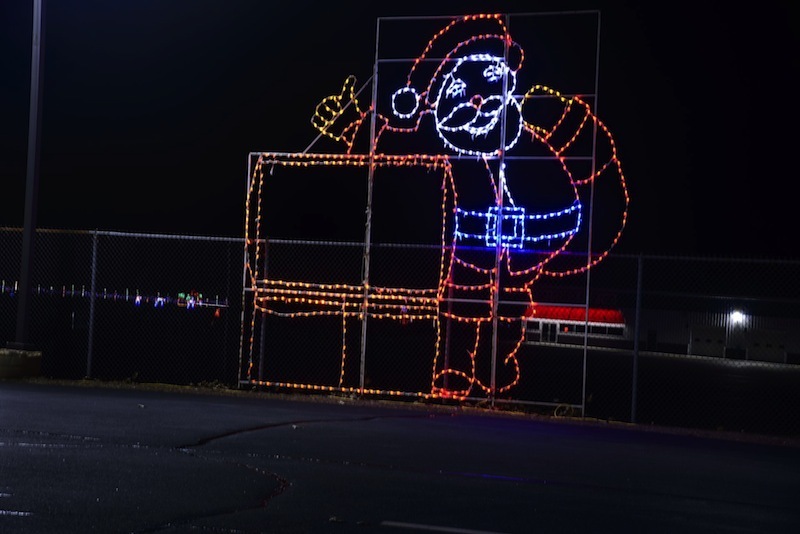 The speedway’s portion of the proceeds generated from the Gift of Lights will be distributed by the New Hampshire Chapter of Speedway Children’s Charities to nearly 50 different organizations scattered across the Granite State and New England. Where does the route go? The course begins at the South Gate and winds around the outside of the grandstands and even includes a stretch of the road course. New this year is the addition of the infield portion of the route, which will take participants down VIP Street, right next to where NASCAR drivers have their motor homes during race week. 36 … days that the Gift of Lights will be open, running daily from 4:30-9 p.m. It will be closed on Nov. 23, 24, 30; Dec. 1, 7, 8, and Christmas Day. 100 … pounds of chocolate is expected to be eaten during the Gift of Lights at the free s’more pit provided by Hannaford Supermarkets. The s’more pit will be open Thursday through Saturday and is free of charge. The fire pit is located across the parking lot from the main office. All necessary supplies will be provided by a member of our staff at the location. 130×2 … The popular Tunnel of Lights has a new location in the New Hampshire Motor Speedway infield tunnels. The 130-foot long tunnels will be illuminated with holiday lights upon entry and departure of the infield, giving participants double the experience of their favorite featured display. 1,000 … participants are expected to take part in the third annual “Yule Light Up the Night” holiday-themed 2.25-mile run/walk through the Gift of Lights on Sunday, Dec. 13 at 4:00 p.m. The charity run/walk is $25 for adults and $10 for kids 4-11, if you register online. Children ages 3 and under will be free. Proceeds of “Yule Light Up the Night” will benefit Speedway Children’s Charities. Runners are encouraged to dress festive by wearing their holiday best and show holiday spirit. Please note that the Gift of Lights will not open for cars until 5:30 p.m. on this day. 4,700 … ounces of hot chocolate is expected to be consumed during the Gift of Lights over the course of 36 days. The liquid refreshment is available at the end of the Gift of Lights route. 6,500 … pictures with Santa Claus are anticipated to be taken. All participants may have their pictures taken with Santa inside the Speedway World gift shop for $5. Also, a special 10 percent discount on all non-Gift of Lights merchandise will be given at the Speedway World souvenir store, which has extended hours for the holidays. Now’s the time to stuff the stockings with official championship and special edition 25th anniversary speedway gear. Frosty the Snowman will be available for pictures starting Dec. 26. 13,000 … pounds of food or more is anticipated to be donated to the Loudon Food Pantry. Participants that bring three or more non-perishable items will receive a $2 discount on their Gift of Lights entry. More than 2,000,000 LED lights will be a part of the Gift of Lights. The highly-efficiency LEDs are brighter and use only 1/10th of the energy of incandescent bulbs. $100,009 … has been distributed to children’s charities throughout New England through the first four years of the Gift of Lights. On Saturday, Nov. 28 the Loudon Fire Department will be on hand to sell Christmas trees, as well as help with hand-decorated bird feeders. For more details and ticket information on events at New Hampshire Motor Speedway or to purchase tickets to the July 17 and September 25 NASCAR Sprint Cup Series race weekends, please stop by our Ticket Office, visit the speedway website at www.nhms.com, or call our Ticket Hotline at (603) 783-4931. The only gift of lights I want to see are the lights they put around the oval so we can see our beloved mods at night ! One day show under the lights that’s what I’m talkin bout.